I am a big fan of easy recipes that do not require a lot of ingredients, are quick, and are still delicious. I also had red tomato sauce as topping for pasta way too often so that I am always excited about finding a new topping for fresh pasta (see previous posting). A new way (at least for me new – research online showed that this is pretty well known already) to eat pasta is with sage butter. I participated in an Italian cooking course recently here in Florence, and one of the dishes we learned how to make was spinach-ricotta ravioli with sage butter. Even though we received a booklet with recipes after the course, the recipe for sage butter was not included; it is so simple, it does not even need a recipe. It is as simple as it sounds: butter and sage and salt and pepper to taste. Some online recipes do add a little bit of lemon juice, but I have never tried that. The ingredients are butter (I always opt for the grass-fed dark-yellow kind of butter) and fresh sage leaves. Several recipes online offer specific measurements of butter and fresh sage, but since I did not receive a recipe form my cooking instructor, I just go by gut feeling: how many people do I need to feed and how much do I like the sage taste, and I adjust measurements accordingly. The procedure is simple: melt the butter over a low heat and let brown, and add as many fresh sage leaves as desired (I like sage, so I add quite a lot). The leaves will turn a little crispy. Remove from the heat and toss the ravioli in the butter/sauce. It is as simple as that. If you like a more traditional recipe format with measurements, try this one I found online. Mix the flours and make a large well in the center of the mound of flour (in a bowl or on a board). Add the two eggs into the well and add salt. Beat the eggs with a fork and slowly start to incorporate the flour from the perimeter until a dough forms (start using your hands once the dough is pretty dry). Knead until the dough is smooth and elastic. The movement was described by our instructor as push and fold: press the dough down with your hand and then fold it once to become a thicker ball of dough again; push with the ball of your hand to flatten the dough and then fold; and so on. Once the dough is elastic (but be fast, so the dough does not dry too much for ravioli), cut the dough in half. Roll it with a pin, fold, roll, and repeat three times. Run the dough through the different settings of the pasta machine (6-4-2: at least for the machine we used). Fold the dough to fit exactly the width of the machine and repeat the process, but for ravioli end with the setting on 1. Fresh egg pasta takes only a couple of minutes to cook; even filled ravioli will take only 4-6 minutes. If you are not ready or do not have the time to make your own pasta, buy fresh pasta from a store and try the sage butter. The most time-consuming part of the recipe is then getting the water to boil. Buon Appetito. In case you are curious, I took the cooking class with In Tavola. I have never thought of myself as a pasta lover/fan and I usually avoid pasta in the U.S. It is just too much of the same taste with each bite for me and I get bored of the taste and consistency quickly. So I was excited to start tasting the food in Italy, where pasta is not a main dish and definitely not the only dish for a meal as I am used to from the U.S. (adding bread sticks does not help, Olive Garden). Here the pasta portions are smaller and are followed by a meat dish most likely. I can get on bored with that. In addition, pasta is a lot more varied than tomato sauce with or without meat or the white creamy white sauce offered in mainstream American restaurants. For example, I had a lasagne that did not include any tomatoes but a thick brown sauce and radicchio and meat in between the layers of pasta. Some of the key ingredients for the recipe. I went cheap and bought the store-brand fresh pasta. Fresh pasta does not take long to cook, so I recommend getting the water boiling while preparing the sauce and then cooking the pasta just when the sauce is already done. Place the butter and olive oil in a wide pan over medium heat. Once the butter has melted, add the lemon zest and cook for a minute while stirring (do not burn). Add the lemon juice and let simmer for a minute. Add the goat cheese and let it melt into a sauce. If it seems too thick, add a few spoonfuls of the pasta water. Season with salt and pepper. Add the cooked pasta and toss in the sauce to coat. If it seems dry, add a little more of the pasta water. Garnish with chopped parsley and add Parmesan cheese. This recipe is from The Florentine, but I changed some of the directions based on my experience with this recipe (for example, the original adds a lot more water, which made the sauce too runny for my taste). The pasta is tangy and light, and I finally know what I can do with all the lemons in my California backyard next winter. I have been talking about this recipe to so many people around here and handed out paper copies of the one published in the newspaper that I decided that it makes sense to add it to the blog. Who needs cream or tomato for fresh pasta sauce! Austrian cuisine has a dumpling for any occasion and season. At this time of the year when pounds and pounds of fruits such as apricots and plums all seem to turn ripe at the same time, my favorite dumpling is a fruit dumpling – either apricot or plum. But there are also dumplings with strawberry, chocolate, poppy seed, nougat, and more and that without considering the many savory versions. Even though most cookbooks list sweet dumplings as a dessert, I am used to eating them as an entrée. Yes, meatless (Fri)day did not usually mean fish or a vegetable casserole but Mehlspeisen (literally “Flour Dishes”) with such favorites as sweet dumplings, sweet crepes, Apfelstrudel, and more in Austria. If it is not called a cake or pie, it can be eaten as an entrée; this is one of my favorite traits of Austrian homecooked meals. As apricots and plums are ripe for the picking in California, I finally decided to try making these sweet dumplings from scratch. I have seen my grandmothers and my mother all make them plenty of times when I grew up, and it never seemed that complicated or time-consuming. Well, the first problem I ran into was that some of the ingredients listed in the handwritten recipes I found from my mom were hard to find. One recipe called for semolina and two of the supermarkets near me did not have any or did not even know what it was. Since I had the fruit already picked and on the verge of becoming overripe in my kitchen, I did not have time to order online and wait for delivery, so that recipe was a no-go. Another recipe called for Topfen, but dictionaries and online users even disagreed on how Topfen would be translated into English, so how would I know where to buy it? Many called it farmer cheese; others called it curd cheese. Online postings seem to agree that whatever you call it, it is hard to find and they recommend to shop in a location with plenty of German or Austrian immigrants. So I discarded that recipe as well. I ended up with a very basic recipe that worked out but did not create a very fluffy dough. However, my husband asked for seconds (after I nearly begged him to try the first dumpling), so that is a good sign. 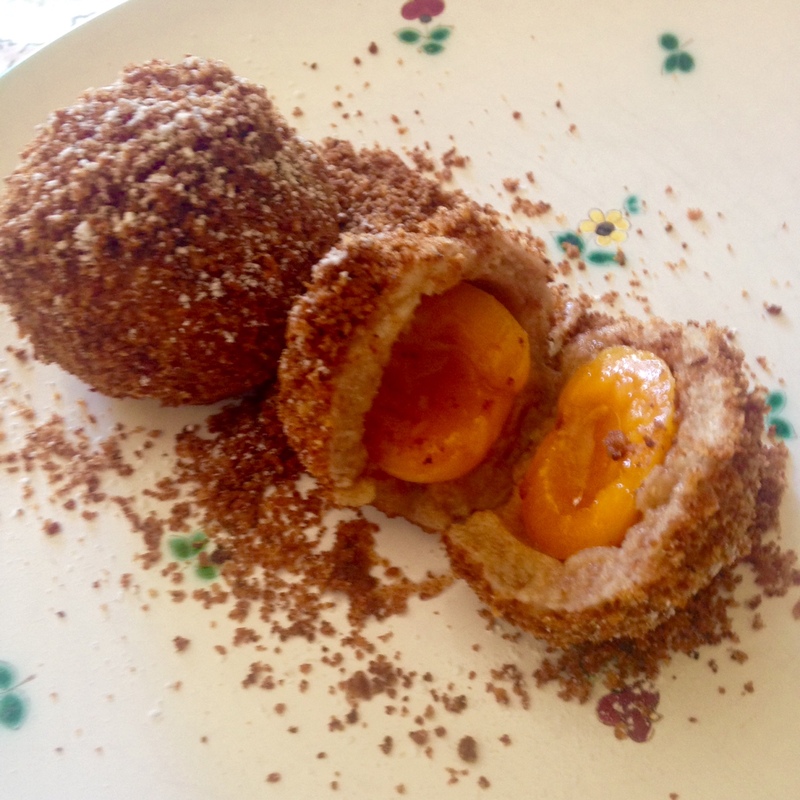 These dumplings are either Marillenknoedel (apricot) or Zwetschgenknoedel (plum). Side note: Germans do not use the word Marillen or Zwetschgen for these fruits but Aprikosen and Pflaumen. 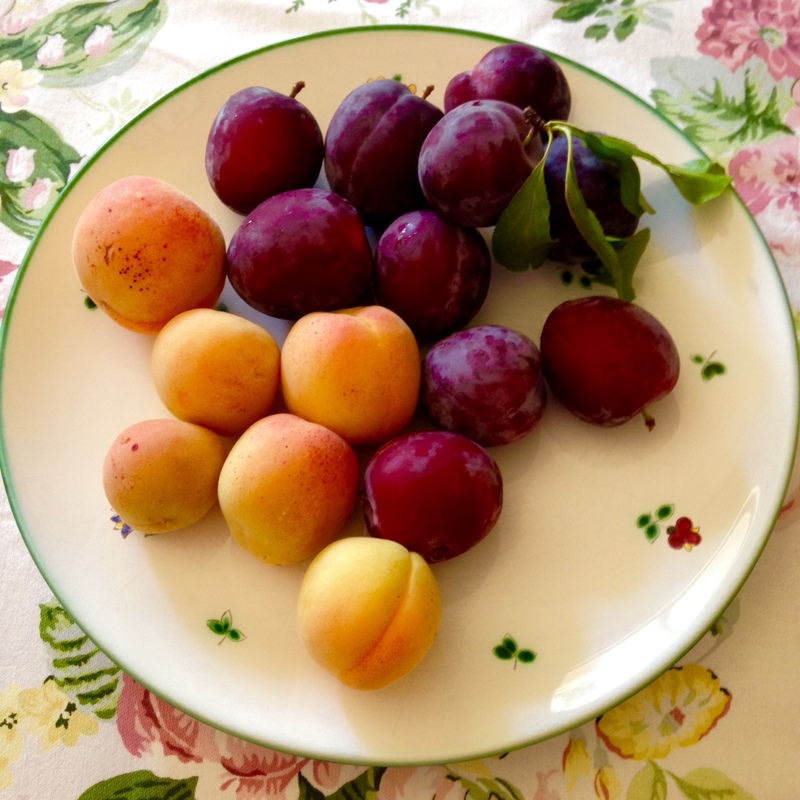 The following recipe works well for apricots and plums; if you have access to semolina and/or Topfen, I would recommend trying a different recipe though. I used whole-wheat flour and the recipe worked but the dumplings were much darker and a little doughier than they would have been with white flour. Also, the original recipe did not call for any butter for the dough, but the dough seemed to form more easily with the butter, so I added it. Force the cooked potatoes through a ricer or use a masher. Add the flour, butter, yolks, and salt and form into a smooth dough. While you let the dough rest for a few minutes, prepare the fruit. 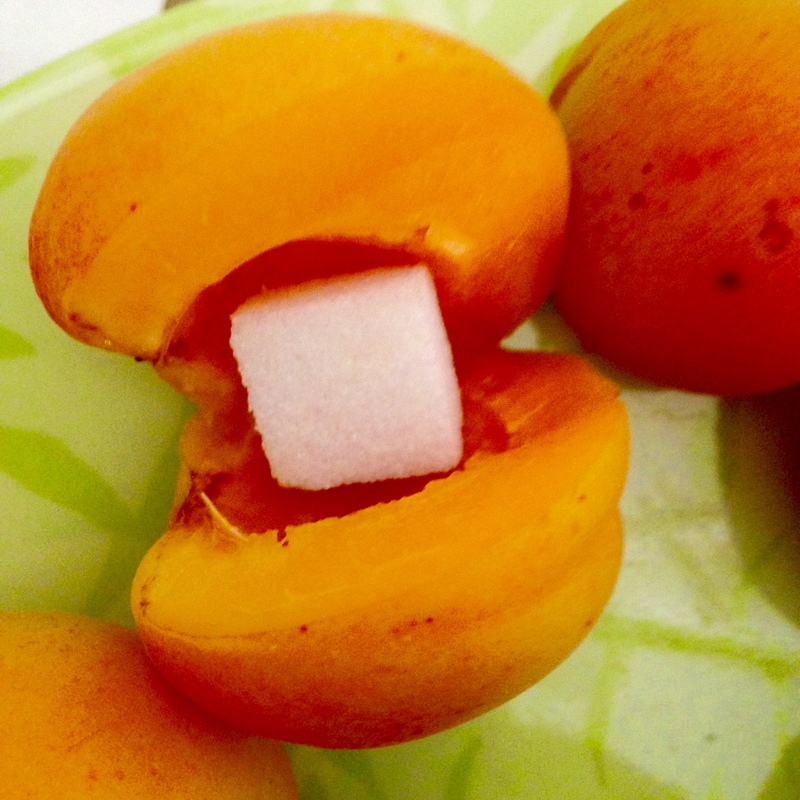 Carefully remove the pit/stone from the fruits (by cutting a slit halfway around the pit and then sliding it out from the fruit); replace each pit with a sugar cube and close each fruit. Form dough into a thick roll; cut off slices to form into dumplings. Place one piece of fruit onto one slice and cover the fruit completely. Try to keep the dough cover as thin as possible without rupturing the dough. You are aiming for a dough cover that is ¼ inch. Make sure that seams are closed. Bring a large pot of salted water to a boil and carefully add 4-5 dumplings into the water. The dumplings need to have room to move and must not be layered. Cook for 10-15 minutes (do not let the water bubble too much as dumplings may fall apart). You know the dumplings are done when they rise to the top and start to turn in the water. In the meantime, melt 3 tbsp. of butter in a skillet and add the breadcrumbs, stirring and cooking until golden brown (I like mine a little darker). Remove the dumplings with a slotted spoon. Cover/sprinkle (depending on how many breadcrumbs you prefer) with breadcrumbs and with powdered sugar. Enjoy while warm. The uncooked dumplings can also be frozen; I wrapped each one individually in foil and then stored them in a plastic bag so I could cook even just one if I wanted to. To cook, put the frozen dumplings into boiling water without defrosting them first. I would make the breadcrumbs fresh (I have never tried to freeze the breadcrumbs). I also warmed up some cooked dumplings in the microwave and they were alright but not as good as the freshly cooked ones. Verdict: It took much longer than I thought (close to an hour) and the dough was not quite the same as I was used to, but the dumplings were good and I used up all the ripe fruit. Once I figure out how to get semolina and/or Topfen, I will try another recipe though. I did enjoy making a dish that brought back memories of eating lunch at my grandmother’s after we had picked plums or apricots for most of the morning. Spear washed and dried okra pods on short bamboo skewers, which have been soaked in cold water for an hour (so the wood does not burn). 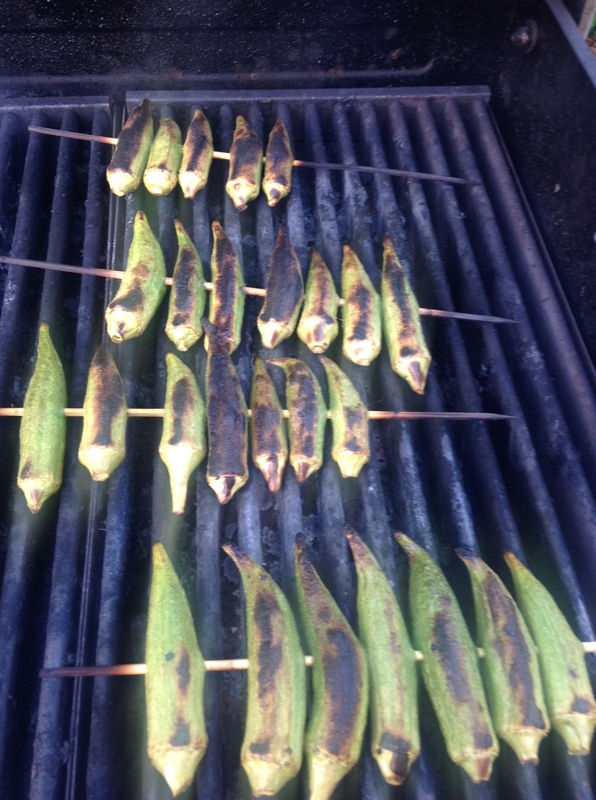 Lightly brush both sides of the okra pods with olive oil and put on the hot crate of the BBQ. Grill for 4-5 minutes on each side. 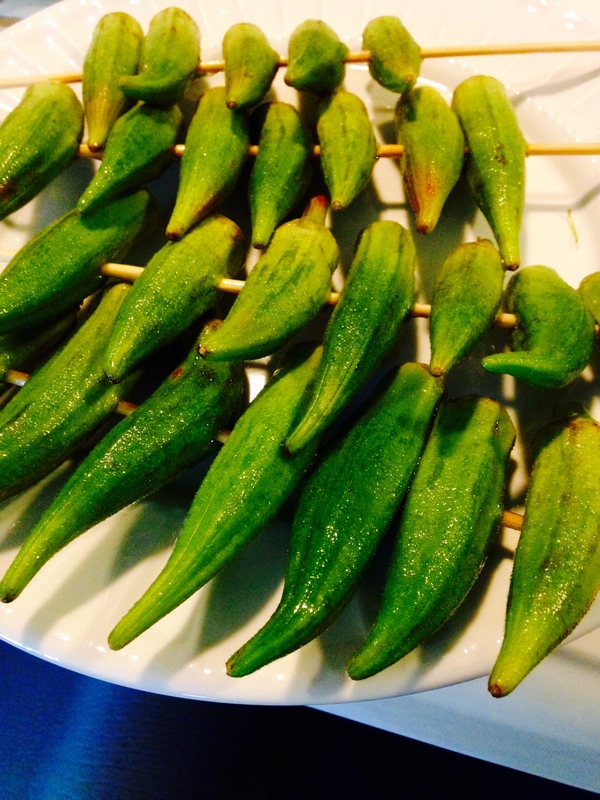 Serve okra at once and enjoy the sweet and earthy flavor. 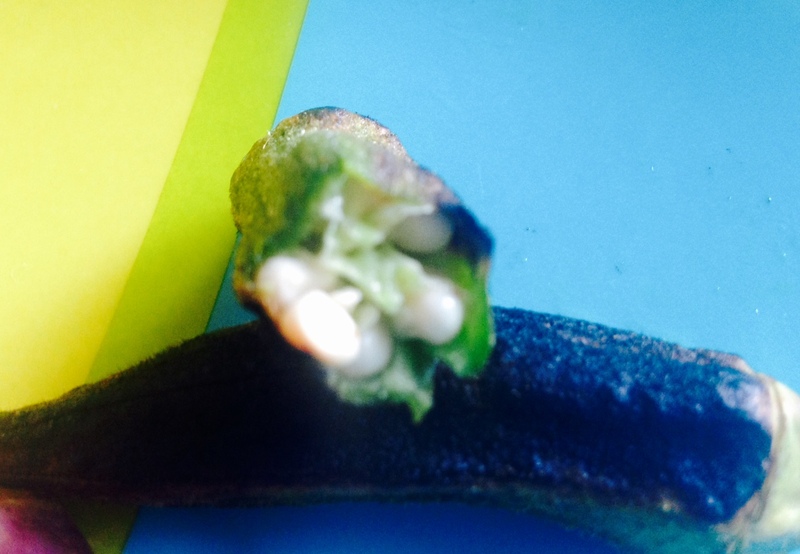 The inside does not turn slimy and the consistency reminds me of grilled green asparagus, but the white okra seeds pop in the mouth (the seeds call to mind the consistency of tapioca). For more complex recipes and more ideas for Okra, see this page: Recipes from Southern Living. Now that fresh okra is readily available, I am looking forward to trying out more recipes. Since moving to the U.S., I have missed plenty of Austrian but also Czech dishes and am usually not too happy with the American renditions of those dishes that do exist here (yes, I am looking at you sauerkraut). But by now there are also plenty of American dishes that I would miss. One of my absolute favorites is fried pickles; it is ingenious – dill pickles are great to begin with, but fried they are pretty much heavenly. 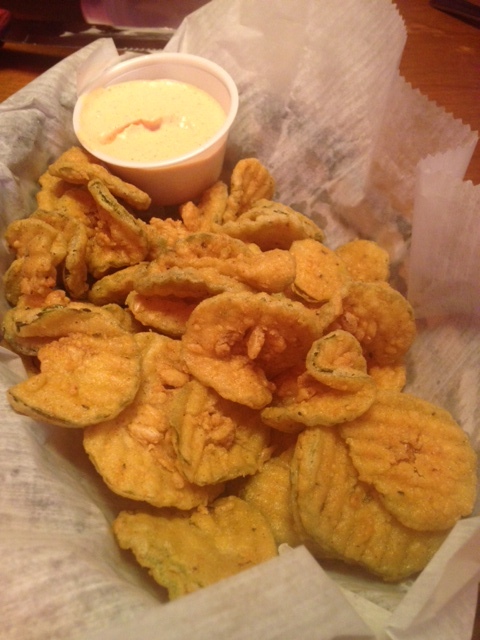 Fried pickles are exactly what they sound like – sliced and battered dill pickles that are fried in hot oil and then served with a dipping sauce such as Ranch. Since my husband hates pickles in any form – fried or not, this is also one of the appetizers that I definitely do not have to share during a dinner out. My favorite local version of the dish is served at the Texas Roadhouse chain restaurant, which also offers another favorite – peanuts. Since I very rarely like the bread served in the U.S. (too soft, too fluffy, too white), I am excited that the restaurant offers peanuts in addition to the obligatory free restaurant bread that I usually just ignore anyways. Between the free peanuts and the addictive fried pickles, I have a nearly perfect meal; add a couple of beers, and I do not even need the steak when we eat out at this steakhouse (yes, I am a cheap date). 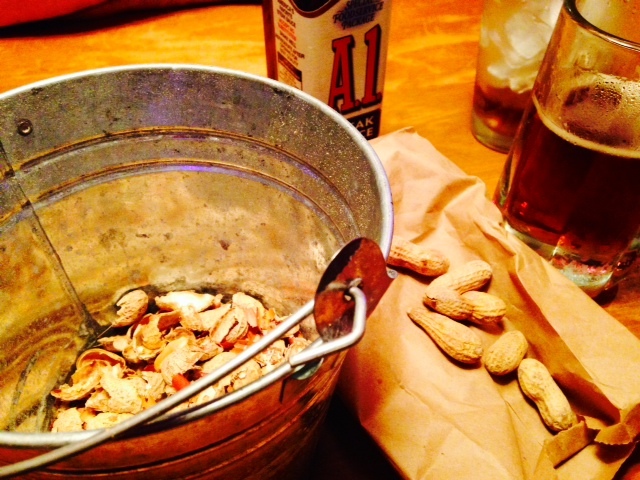 Peanuts are great as appetizer, snack, with beer, and in between courses. The following recipe for fried pickles is based on the recipe from Betty Crocker and works well. I also like that the site does not offer any nutrition information for the fried pickles – it would just ruin a perfectly fine food. Pat pickles dry with paper towels. In a shallow bowl (I would call it a Suppenteller in German), mix 1 cup of buttermilk and the hot sauce. In another shallow bowl, mix the flour, cornmeal, and Cajun seasoning. In a heavy saucepan, heat 2 to 3 inches of oil to about 350 degrees Fahrenheit. Dip the pickles in the buttermilk mixture; then dip them in the flour mixture to coat them. Work in small batches to fry pickles about 2-3 minutes or until golden brown. Drain on paper towels. Sprinkle with salt and serve them warm with a dipping sauce such as Ranch. Try not to eat the whole batch on your own. 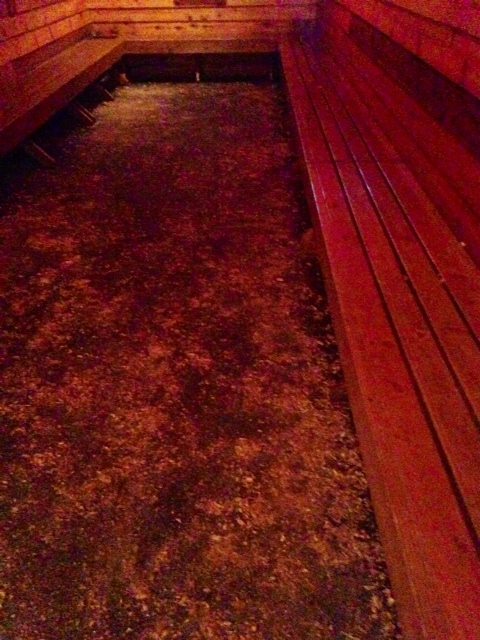 The floor at the restaurant is covered in peanut shells. No Christmas market or fair is complete without roasted almonds. In German, they are called gebrannte Mandeln (“burnt almonds”) or Wiener Mandeln (“Viennese Almonds”). The sugar-coated nuts are absolutely addictive and have always been one of my favorite snacks at fairs and Octoberfest. The sweet treat is so much part of the German/Austrian culture that specialty shops also sell them at German cultural events in the States – but they are expensive, and the problem is that I am always tempted to eat my weight in roasted almonds. 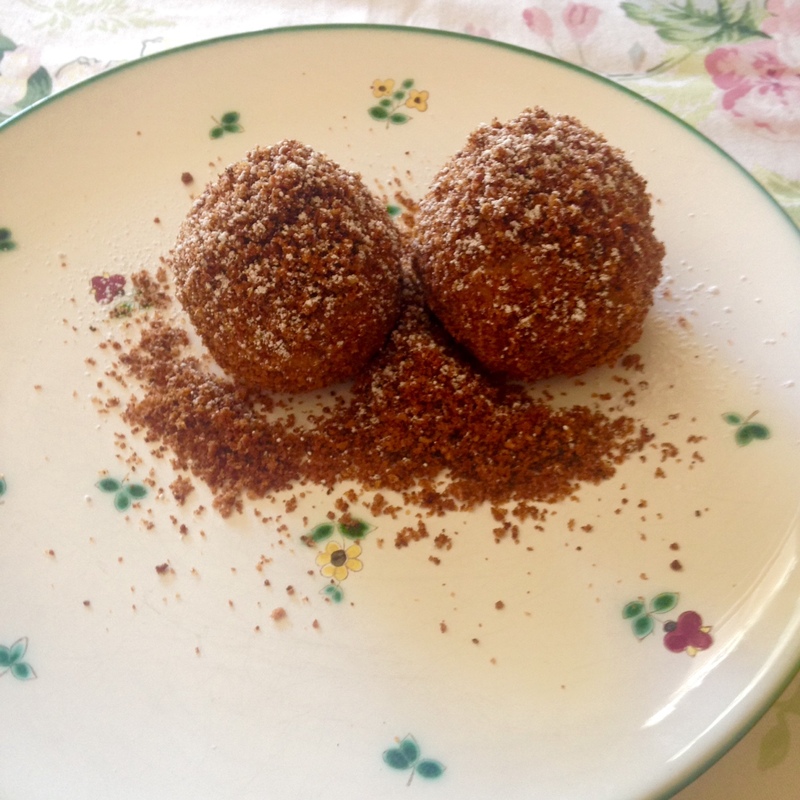 So I was excited to learn that these nuts can also be made at home without any special equipment – it takes a lot of stirring, but the whole house smells of sugar and cinnamon for days afterwards, so it pays off. So no more waiting for special events with vendors to enjoy the roasted almonds! Here is the recipe that has worked well for me. On medium heat bring the cinnamon, sugar, vanilla sugar, and water to a boil in a large pan [I use a Wok since that is the only large non-stick pan I have]. Add the almonds and stir until the sugar is dry again. This will take a while – 15 minutes or more. Continue stirring until the sugar starts to slightly melt again and the almonds start to shine [this will take another 5 minutes or so]. 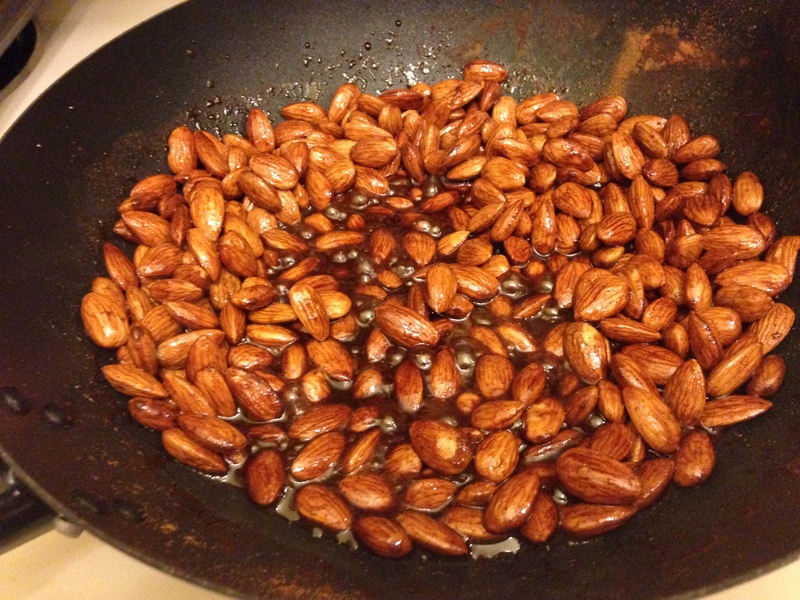 Empty the almonds onto a backing sheet, divide them if stuck together, and let them cool. Keep in an airtight container. 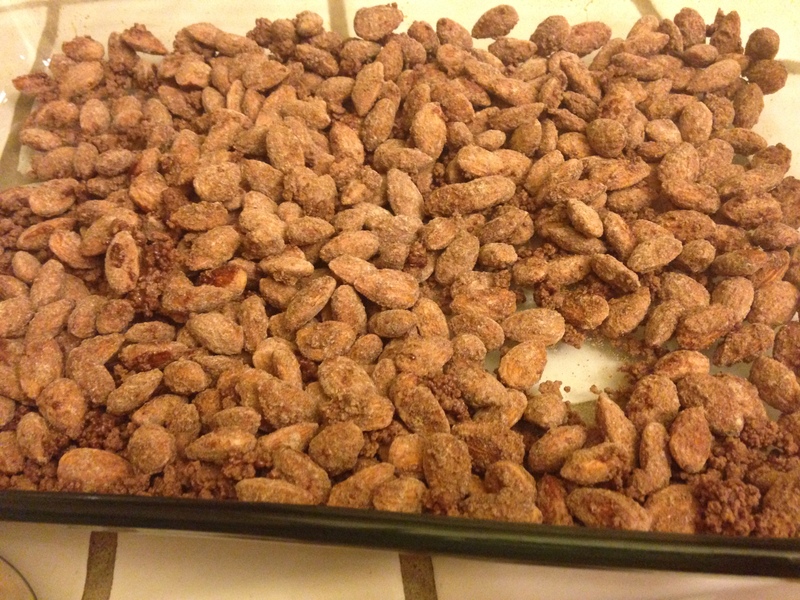 I have no idea how long the almonds will stay fresh since they usually are eaten in a few days in my house.